Jose Padilha’s spirited remake of RoboCop is one of the nicer surprises to come out in some time. Energetically directed with a mostly clever script and a fun supporting cast, it is marginalized only by occasional, errant attempts at sincerity. While it may not contain the complexity or bite of Paul Verhoven’s wonderful original, this Robocop remains a fun, well-made action movie. 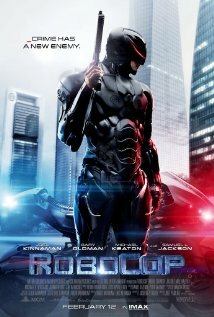 Similar to the original, this RoboCop concerns a violently maimed police officer, Alex Murphy (Joel Kinnaman), who is resuscitated as a crime fighting man-machine hybrid. The giant corporation Omnicorp has already deployed thousands of crime fighting robots around the world, but the American people aren’t yet willing to accept non-human police officers in their streets. To swing public opinion, OmniCorp head Raymond Sellars (the delightful Michael Keaton) sees an opportunity to introduce Murphy as a product with the skill of a robot but the conscience of a human. Rather than just applying a coat of shiny CGI wax to the original, Padilha and screenwriter Joshua Zetumer provide some robust additions to the story, particularly in dealing with the interaction between Murphy’s mind and the machine he inhabits. At one point, to make him as efficient a soldier as one of their full robots, Murphy’s evaluation team must figure out how to sidestep Murphy’s conscience – “an extra step” in the decision-making process. The answer involves simply taking out one computer chip in his brain and replacing it with another. Later, when Murphy becomes over stimulated by crime alerts around the city, his doctors use a software program to control his brain’s chemical balance. Though he is appealing to Americans because he has a human brain, Omnicorp spends much of his development reducing the amount of influence Murphy has over his body. RoboCop is at its best when Padilha satirically examines issues of control, free will, and the essence of humanity. However, the film comes to a screeching halt every time Murphy’s family enters the picture. One of the remake’s misguided expansions of the original, Padilha’s RoboCop has Murphy returning to his wife and son, dragging the film down by attempting to wring sincere drama out of Murphy’s reintroduction to his family. Everything in these scenes is stale and ugly. As Murphy’s wife, poor Abbie Cornish has more tears in this movie than lines of dialogue. Though far lighter than Verhoven’s razor sharp satire, Padilha’s version is still fun. The action sequences are inventive and exciting, skillfully infusing the special effects with a vibrant, gritty quality consistent with the rest of the visual style of the film. Overflowing with top-billable talent, the supporting cast turns in fun performances without getting in each other’s way. Samuel L. Jackson stands out in particular, as a Glenn Beck-style news show host, delivering every line with his typically infectious flair. The satire may be light, but it’s good for a handful of laughs. The new RoboCop lacks the depth of the original, but it’s far better than most other contemporary action/sci-fi/superhero movies. That may not be saying much, but it’s something.